Added a new tutorial called Reaction Diffusion In Photoshop. Added a new tutorial called Different Types Of Weathering. Added a new discussion piece called Choosing Software For Your Own Personal Art Pipeline. Added a new opinion piece called The Current State Of PTEX And UVLess Workflows For Realtime Rendering. Updated my Dirty Rusty Decaled Painted Worn Metal tutorial with a simpler workflow and better looking results using my newly available asset packs. Updated my Turbulence Noise and Procedural Patterns and Noise tutorials with new information. Added a new tutorial called Turbulence Noise. Added a new tutorial called GGX Shading Model For Metallic Reflections. Added more details to my Procedural Patterns and Noise tutorial. Added a bunch of new info to my Blended Box Mapping tutorial. 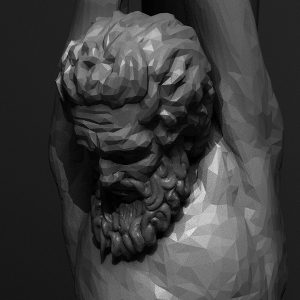 Added a new tutorial called Implicit and Explicit Procedural Noise. Revised How Do I Shade / Texture Stuff? : Shading Workflow Overview reorganizing the information a little to be more clear. Revised Blended Box Mapping a bit in light of the fact that the CameraMapGemini plugin has not been recompiled for more modern versions of max. Added a bit of extra info to Worn Edges Using A Distorted Vertex Map. Added a new tutorial called Using Details To Make Something Look Big. Added a new video tutorial called Exploring OpenSubdiv in 3ds Max 2015 Extension 1. Added a new video tutorial called Designing An Epic Starship Part 3: Detailing The Upper Level. Added a new video tutorial called Designing An Epic Starship Part 2: Detailing The Trench. Added a new video tutorial called Designing An Epic Starship Part 1: Choosing A Form Using Silhouette Sketches. Added a new video tutorial called Texturing A Robot Hand. Added a new video tutorial called 3D Sketches As A Base For A Painting. Added a new tutorial called How To Use The soulburnAssetLoader (SAL). Added a new tutorial called Structure And Naming Conventions For Materials. Added a new diagram to How Do I Shade / Texture Stuff? : Shading Pipeline Overview. Added a link to a new video on Blended Box Mapping. Added a new real world photo to Tiled Floor Material. Added a new opinion piece called Go To School Or Learn CG At Home?. Updated my How Do I Shade / Texture Stuff? : Shading Pipeline Overview lesson with a bunch of new info, especially on pattern placement methods and pattern storage. Added a new tutorial called Switchers And IDs, Which To Use When. Updated my other 2 switcher lessons and my texture baking lesson with the new info. Added a new video lesson called Subdivision Surfaces Using Support Edges (The Basics) . Added a few more examples to my Procedural Noise lesson. Added some more info on MaterialByElement to my Randomizing Patterns Using Switchers lesson.